Norway’s National Tourist Routes are unique – 18 drives that cover most of the country, and boast roadside stops that could fill an entire architecture journal. This 14-night itinerary incorporates three of our favourite routes (the Lofoten, Andøya and Senja) as well as a stay in the university city of Tromsø. On arrival at Tromso Langnes airport, collect your hire car and self transfer to the centre of the university city. Your accommodation is the modern, Clarion Hotel The Edge. During the summer months, Tromsø and the surrounding region is bathed in the midnight sun (21May-21Jul). Take a hike or a drive in the mountains and rest at the summit whilst watching the sun dipping towards the horizon before climbing again to signal the start of another day. Overnight at the Clarion Hotel The Edge in Tromsø. From Tromsø, drive southbound to the island of Senja (c.3 hours). The drive along the outer edge of Senja – a National Tourist Route - is a journey past deep fjords, beaches, precipitous mountainsides and idyllic hamlets. Overnight at Hamn I Senja on Senja. Day at leisure on the island of Senja, considered by many the most beautiful of Northern Norway’s arctic isles. We would recommend that you head inland to the mountain plateau at the heart of the island. Alternatively, take a hike in the mountains surrounding Hamn. Take the boat from Gryllefjord, on the island of Senja, to Andenes on the Vesterålen archipelago. On arrival at Andenes you will pick-up the Andøya National Tourist Route, which runs along the outer edge of the island and past its three nature reserves. Continue your drive to The House on the Outside on the island of Langøya – c.3 hours from Andenes. Overnight at The House on the Outside in Ringstad. For the outdoor enthusiast, Vesterålen offers a natural playground with marked hiking trails, kayaking opportunities, cycle routes and an abundance of bird life. Continue your exploration of Norway’s dramatic and awe-inspiring coastline by travelling south to the capital of the Lofoten, Svolvaer. Overnight at the Svinøya Rorbuer in Svolvær. 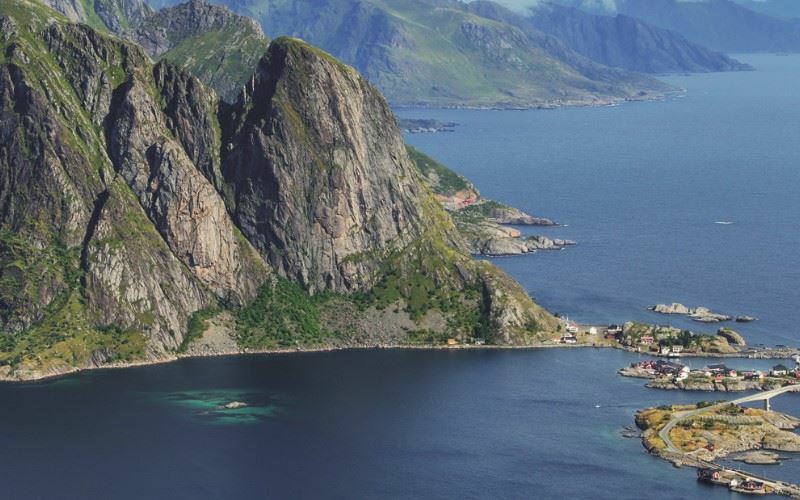 Opportunity to explore the northern islands of the Lofoten chain. We would recommend visiting the Lofoten war museum and the village of Kabelvåg, or participating in one of the many outdoor activities available in the area - kayaking, rib boat tours, cycling and hiking. After breakfast, drive south towards the historical village of Nusfjord. The road between Svolvaer and Nusfjord is part of the Lofoten National Tourist Route and travels alongside craggy alpine peaks, glistening white sandy beaches and fishing villages. Overnight at the Nusfjord AS Rorbuer in Nusfjord. Opportunity to visit Kittiwake cliffs in Å, the picture-postcard village of Reine, the glass and ceramic studio in Vikten, the smithy at Sund and the beach at Ramberg. In the evening drive to the village of Stamsund, where you will board the Hurtigruten with your car (at 19:30) and sail overnight towards Tromsø. Overnight and dinner on board the Hurtigruten. Free morning on board the Hurtigruten, arriving at Tromsø at 14:30. Self transfer to the Clarion Hotel The Edge. Afternoon and evening at leisure in Tromsø. Overnight at the Clarion Hotel Edge in Tromsø. Transfer to Tromsø Langnes airport for your return flight to the UK. Owner-managed by Karina and Ian, ‘The House on the Outside’ is located on the island of Langøya in the north-west of the Vesterålen archipelago surrounded by small rural hamlets and bordered by the blue waters of the Norwegian sea and an archipelago rich with bird life, fish and otters. Owner-managed by Karina and Ian, ‘The House on the Outside’ is located on the island of Langøya in the north-west of the Vesterålen archipelago surrounded by small rural hamlets and bordered by theblue waters of the Norwegian sea and an archipelago rich with bird life, fish and otters. White Tailed Eagles; Black-Backed Gulls and Kittiwakes are regularly spotted from the terrace of this delightful property. At ‘The House on the Outside’ guests are welcomed as friends, and Karina and Ian (an Englishman) are always on hand to answer questions or to provide guidance on places to visit and activities to undertake. Ian is a trained kayak guide, passionate ornithologist and an experienced photographer and offers a range of experiences that can be pre-booked and tailored to meet individual requirements. A simple yet cosy sea-house where personal service and tranquillity are guaranteed to alleviate the stresses of everyday life. Three apartments enjoy a view over the small marina and surrounding mountain peaks. Step back in time with a visit to Nusfjord and gain an insight into the traditional cod fishing industry of the Lofoten. One of Norway’s best preserved fishing villages, Nusfjord is a living museum with exhibition buildings depicting life in the late 18th and early 19th centuries. Step back in time with a visit to Nusfjord and gain an insight into the traditional cod fishing industry of the Lofoten. One of Norway’s best preserved fishing villages, Nusfjord is a living museum with exhibition buildings depicting life in the late 18th and early 19th centuries. Here, you can visit the old boathouse where many a fisherman worked, make a purchase at the general store dating from 1907 and stay in an original Rorbu. 50 captivating cabins provide comfortable lodgings all year round, and although popular and alive with tourists during the summer months, the traffic-free centre of Nusfjord becomes secluded and silent during the snowy winter season. The Oriana Inn and an à la carte restaurant, Karoline, provide somewhere to drink, dine and unwind after a day of exploring the area. National Heritage Rorbu are listed buildings, are simply furnished and consist of an open plan loft sleeping area (sleeping four). At the front of the cabin is the ‘bugang’, the area where fishing equipment was historically stored. Due to the protected status of these cabins, alterations to the structure are not allowed and therefore these do not have an en suite bathroom - a separate building and shower/WC is located c.50m from each cabin. 5 fishing lakes can be found in the area. A fishing licence can be bought at the reception.